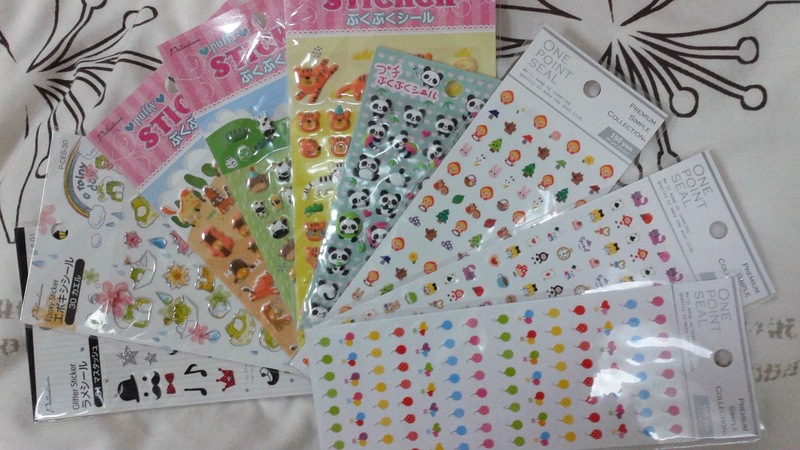 Recently, whenever I go to the shops, any stationery or 100 yen shop, I can’t stop myself from buying stickers. In a place like Japan – the land of kawaii – this is dangerous. I probably now have enough stickers to last me until well past the end of the academic year. Oh dear. “It’s for the kids!” I told my friend. “Admit it! They’re for you!” she retorted playfully. I only ever give stickers to my 16 year olds, and that’s only when they do well on their vocabulary tests. They might say (or seem like) they don’t care about them, but I think that deep down in their hearts it makes them happy that I bother. And that makes me happy too, even though they drive me crazy sometimes. But, it’s true – I just use the kids as an excuse to buy them so I can use them for myself too, ha ha. Just look at them! How could I not buy them? You know you’d do the same. From left to right: cute mustaches and other sparkly things, cute froggies, cute horses, cute cows, cute tigers, cute pandas, cute Little Red Riding Hood, cute Alice in Wonderland, and cute balloons. Whew, that’s a lot of cute right there. OMG, I buy stickers, too! Yes, my stickers are incredibly cute! You and me both! I used to collect stickers like crazy. Especially when I went to China and Toronto :). What do you do with all those lovely stickers? I used to make collages out of them in my notebooks but that’s probably not the most artistic way to display them.